Jabulani Mzinyathi was born on 01.09.65 in Ascot high density suburb, Gwelo, Rhodesia (now Gweru, Zimbabwe), to working class parents. He is a qualified primary school teacher turned magistrate, and he holds a diploma in personnel management. In 1997 he was awarded a diploma for excellence by the panel of judges of the Scottish international open poetry contest. 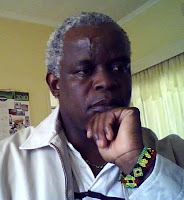 He has had several poems and short stories published by magazines in Zimbabwe and abroad. He also once wrote humour pieces for some newspapers in Zimbabwe, and was a columnist for Moto magazine, Gweru. He has served both as the vice-chairman of the Budding Writers Association of Zimbabwe, and as chairman of the Zimbabwe Poetry Society. 1. Can you speak a bit more about the "resilience" you speak of in that last line? In what ways is it "plain to see"? the ways my ancestors worshipped the creator refuse to die. most of our people faced with life crises will abandon adopted religions and go back to the ways that have been wrongly labelled "ancestral worship". as a black african i do not believe all this crap about ancestral worship. it is a phenomenon that comes out of sheer ignorance and that unbridled desire by some who espouse superiority to denigrate what black africans find spiritually satisfying. i make no apologies! africa was not a dark continent at all. our people knew of the existence of God long before missionaries came with a warped version of christianity that glorifies subjugation. when i at forty-seven still look back and speak out against this i realise that the ways of my ancestors live on in my blood hence 'resilience'. the same resilience is seen in the teachings of rastafari. slavery and colonialism have not been able to annihilate us! 2. Who are you most interested in reaching/influencing with this poem? If you could present this poem to only one person or group of people, who would it be? the poem is a bomb to be dropped among those that convert my people to a version of christianity that treats black people as sin. it is also aimed at those who sheepishly follow alien gods that leave them empty deep inside. it is aimed at those who label us "ancestor worshippers". that is not what we do. we worship God and the messages get to the maker via our ancestors. the poem is also aimed at those who sow divisions against my people along christianity and islamic lines. these are the alien religions befuddling my people. 3. "sacrosanct shrines" has a great sound to it. What inspired that phrase? Did it come early, or late, in the composition process? it hurts me deep inside to know that rhodes brazenly chose to be buried at matopos which is know to be a holy shrine by our people. here are the remains of a coloniser defiantly at our sacrosanct shrine. we talk about maintaining the status quo for the sake of history. what? the story must be told this way: the remains of the coloniser were removed and shipped to Britain to be interred there. that is making history! 4. What is new for you in 2012? How do you see your prospects over the coming year? in 2012 and beyond i will be working with singers to see whether some of the poems i have worked on over the years can assume a new dimension for me. i love reggae music so the beat will have to be that. 5. Similarly, how do you see the prospects for Zimbabwe in 2012? the darkest hour is before dawn. looking into my crystal ball i see a great zimbabwe emerging. the recipe is there. look we have a highly educated population. we are richly endowed with mineral and other resources. we need to shape our poly ticks right. that means we need a new constitution for a future zimbabwe. we need to open up more democratic spaces that includes encouraging artistic endeavours - even those that may be called anti-establishment. the birds will freely twitter in the trees! a new zimbabwe is on the horizon. look yonder and you will see!